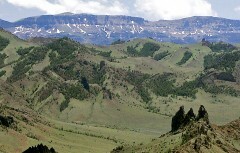 Spend the day or several days exploring the trails and backcountry of the rugged northwest Wyoming landscape. See astonishing rock formations, broad sweeps of forest, wide open meadows, rivers, lakes and abundant wildlife. Or choose the less rugged route on our developed trails and pathways. Much of the land in Cody Yellowstone Country is public land; the Shoshone National Forest, Bureau of Land Management and Yellowstone National Park. Each of these entities has their own set of restrictions concerning hiking or horseback riding on their trails. For further information on hiking inside Yellowstone National Park including downloadable day hike guides please visit the National Park Service website or click the image to the right to enlarge a map of hiking trails. For further information on recreation opportunities in the Shoshone National Forest including hiking trails please download their Visitor Guide. For further information on recreation opportunities on public lands visit the Bureau of Land Management website. baseball and softball fields, BMX/Skating park and more. Please click Cody Parks & Pathways for a map of the various parks and public facilities. The town of Meeteetse owns and operates Lion’s Park, Riverside Park, the Meeteetse Shooting Range and Meeteetse Rodeo Grounds. Amenities include picnic tables, grills, playground, skate park and more. 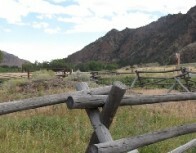 For further information please visit the town of Meeteetse website www.townofmeeteetse.org. Powell has 9 parks offering playgrounds, tennis, softball and baseball fields, skate park, horseshoe pitch, wading pool, bandshell, basketball courts, fishing pond and 1.5 miles of paved trails. For further information please visit the City of Powell Parks Department. 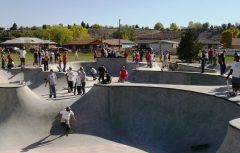 Features include an all inclusive playground, picnic shelter, BBQ grills and an 8,000 square foot skate park wit a multi-use area and a nine foot bowl for more advanced skateboarders. Information and experienced, knowledgeable staff to book all of your outdoor recreation guided trips. Mon-Sat 9 a.m.-8 p.m. Sun 9 a.m.-6 p.m. Climbing school and guide service. Jackson Hole Mountain Guides specializes in tours in the Beartooth Mountains, which are known for their remote peaks, high plateaus, and surprise storms. They also have experts to guide hikers through the Absaroka-Beartooth Wilderness, which has over half a million acres, and is one of the lower 48’s largest contiguous wilderness areas. Half day and full day programs available for all ages. 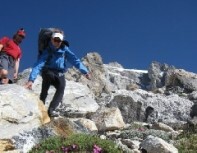 Custom hiking, backpacking, climbing and mountaineering trips also available. JHMG is accredited by the American Mountain Guides Association.